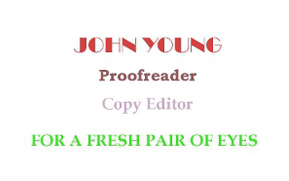 Editing services including proofreading, copy editing, redrafting/rewriting, anglicisation of US English and report writing, all offered at negotiable rates for students, academics, novelists, businesses, charities, and absolutely anyone else in need of a fresh pair of eyes. No project too large or small for a friendly, professional and flexible service. Qualifications include PhD & MA in Film Studies; BA (Hons.) English; Associate membership of Society for Editors and Proofreaders; Maple Diploma in Proofreading (Distinction) and Copy Editing (Distinction). Previous experience includes article editorship of peer-review journal, and report writing and proofreading for market research company on subjects ranging from biodiversity to anti-social behaviour. Interests include film, music, cultural studies, media, history, politics, sociology, fiction (all genres and none, and all shades of noir in particular) and all branches of the arts, humanities and social sciences – including theory at its most abstruse! John did a fantastic job for me proofreading my novel. Really pleased with the quality and speed of work. Highly recommended! John has been copyediting all the novella and longer works put out by Sandal Press, an independent micro-press, since its genesis in early 2011. This has covered, to date, SF, SF romance and urban fantasy. By the time you read this, it may include more. What we appreciate at Sandal is John’s professionalism and open-mindedness. Whether it was an argument over the serial comma, or the spelling of “manila” vs. “manilla”, John has proven himself – time and time again – to be personable, professional, and pedantic. These three characteristics are exactly what you need in a Copy Editor and John has them in spades. In short, highly recommended, although don’t make him too popular or our own books may run into scheduling conflicts with his other work, and we certainly wouldn’t want that. John Young is a great proofreader and copy-editor. He helped me a lot with grammar, vocabulary, meanings; he made suitable suggestions for rephrasing, but did not intervene too much into my writing. Furthermore it was great to be in contact with him. He is very quick, reliable, and answers all your questions that come up after the proof-reading. I could not imagine a better proof-reader and therefore fully recommed him.